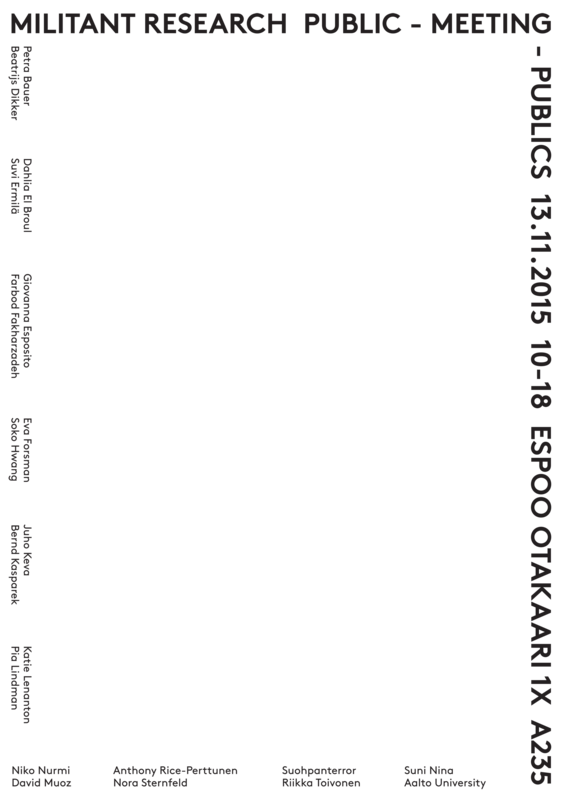 Public meeting – Meeting Publics is an open event held in Otaniemi on Friday 13th of November. The meeting is based on collaborative process of rethingking the mode of the “academic conference” by working on infrastuctures for contact zones and strategies of care for space, time, production and reproduction. Through different activist and curatorial strategies we will relate practices from radical democratic and radical ecologist social movements with critical epistemologies developed in post-structuralist, feminist and postcolonial theories. Key words such as knowledge production or artistic research have become ubiquitous in the artistic and curatorial field. However, they confront us with a real dilemma: on the one hand, knowledge is the main resource of late capitalism, and the production of new knowledge in “critical“ and “creative“ ways is therefore compatible with neoliberal governmentality. On the other hand, critical knowledge production and emancipatory research have always been an integral part of activist practices and anti-capitalist movements and, today, are more prevalent than ever. 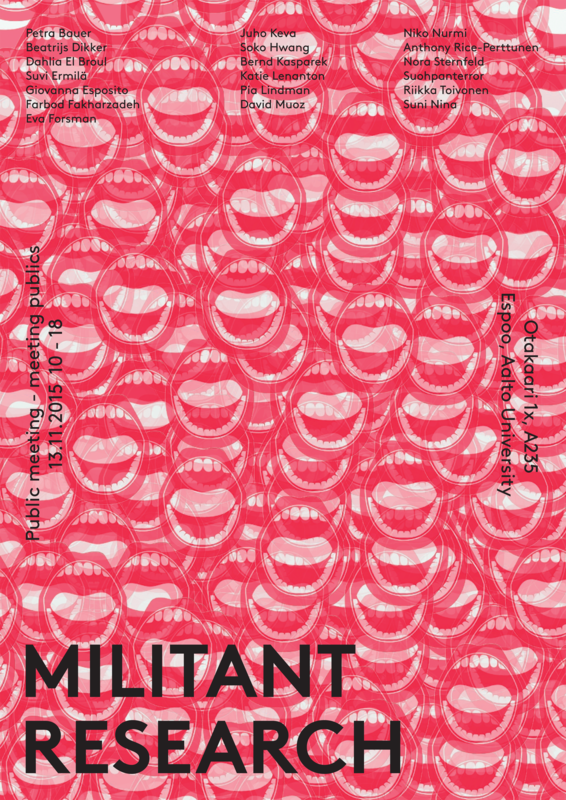 Behind this background the seminar on militant research examines the intersections of art, knowledge and activism. Our understanding of militant research departs from the necessity to bound self-determination and criticality with commonality. It also implies the necessity to nourish the interdependencies between actors through forms of reciprocity as a precondition for stabilizing and enduring sites for knowledges in relation to the commons, and the possibility for a community to emerge. We will begin with a common inquiry in academic practices: how do we do learning? Or more accurately, by following Ivan Illich’s proposition: how do we do unlearning? One of the aims is to redirect these questions in particular within the artistic context, and to engage – through experience – the subtle undivided terrain of the ‘subjective’, ‘affective’ and ‘sensible’, while preserving a critical position upon our processes. How can we reconfigure our articulations of knowledge to uncover the relations of violence, exploitation and degradation we are embedded in? Can the social inquire serve as a platform for the regenerative building dialogues based in a reclaim of justice? Here is where we encounter the militant inquire at its core -in the form of an ethical question, and its re-emergence into various modes of research. Hosted by: Beatrijs Dikker, Dahlia El Broul, Suvi Ermilä, Giovanna Esposito, Farbod Fakharzadeh, Eva Forsman, Soko Hwang, Katie Lenanton, Pia Lindman, David Muoz, Niko Nurmi, Nora Sternfeld, Riikka Toivonen and Nina Suni.